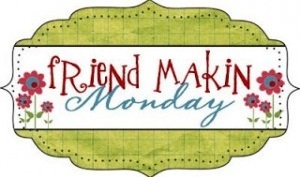 Friend Makin’ Mondays: This or That? It’s been a really busy couple of weeks in Laurieland. I’ve been picking up more clients with my petsitting business, including some emergencies (unfortunately). I’ve had a great run of classes at the gym. After 5 days straight of circuit training, TRX, pilates and yoga I was broken! But, in a good way. 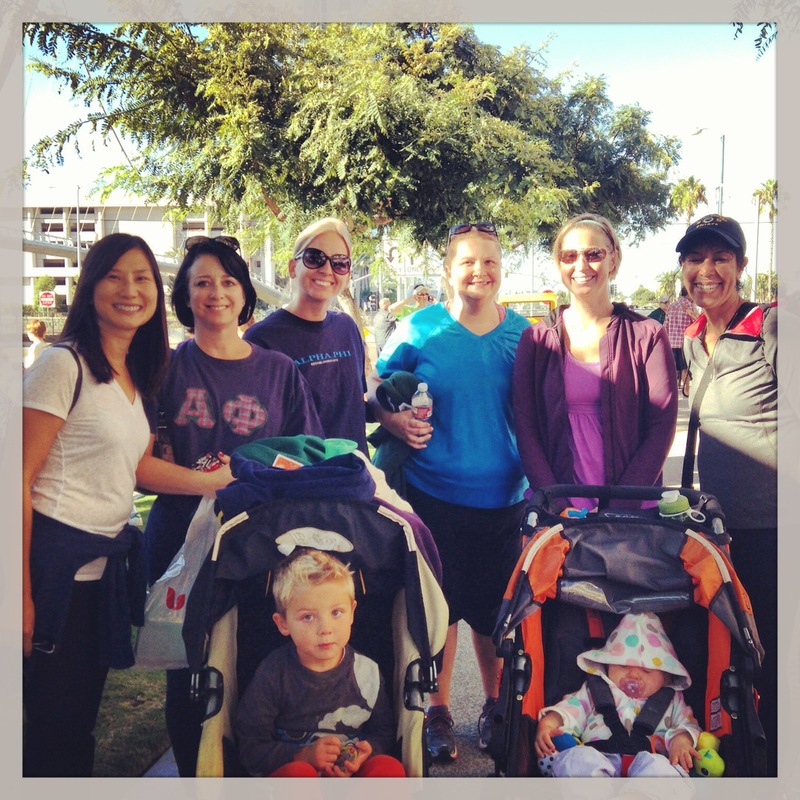 Capped off the week with the 5K Heart Walk with my sorority and more yoga. Here’s our team for the 2013 Heart Walk. I’ve also become a Beach Body Coach. I don’t quite know what I’m going to do with that quite yet, but I like the message of the company and I like the products, so I figured why not? 1. Meat and potatoes or pasta? Both have special places in my heart and tummy, but I’m an anemic Irish girl, so I’ll go with meat and potatoes even though I really do love the pasta. 2. Do you prefer Apple or Android? Oh, no considering on this one – Apple all the way. My Android was always crashing and failing. The best is when I did a mandatory update of apps which then completely broke them. No thanks. I don’t need an open source platform. I need it to just work, and my iPhone always does. 3. Do you kiss and tell, or do you keep it private? I’d like to think I could keep it private, but I’m a blabber mouth. I kiss and tell. And tell. And tell. And tell. 5. Christmas or Valentine’s Day? Valentine’s Day has more pink. But neither one is Easter, the best holiday. 6. If you joined a band, would you prefer to do vocals or play an instrument? In a perfect world, let’s say I COULD do either of these. I think I’d like to do vocals. I love to sing, I’m just terrible. I like to entertain and be the center of attention. I want to be the front woman! 7. Hot weather or cold weather? Honestly, I dislike either extreme. I’m going to say hot weather even though it goes against sage advice from my Grammy : You can always put more clothes on but you can only take off so much! 8. Calorie counting or tracking points? Tracking points. Calorie counting drives me crazy. I really did like WW when I did it, but it was a long time ago. I track my food now, but I don’t get obsessive. 9. Yoga or kickboxing? Another hard one. I like both. Yoga makes me feel more complete though. 10. East Coast or West Coast? Born and raised on the East Coast, but the West Coast is the Best Coast. This will be interesting, fun and probably a little hard of a blog post to completely finish. I’m married. I just celebrated my 4th wedding anniversary and I’ve been dating my husband for 12 years this Christmas Eve. That’s a long freakin’ time! We’re a very solid couple. Right now we aren’t living together for work reasons. He has a fantastic job in a start up in Silicon Valley, and I’m in San Diego living in our condo. There’s a ton of reasons why I’m NOT moving up to be there. San Diego is home to both of us. We’re incredibly grounded and happy here. This is the place where we want to live our lives. Having a San Diego base keeps him from getting caught in the craziness of the Valley. To sell or rent our condo, we’d need to do significant upgrades. I’m starting a business here. Our friends are here and the friends we have here are seriously our family. We belong here, but this is not where his best opportunity is at the moment. So, we’re making it work. He flies back on weekends. I try and go up for a week once a month. We have a lot of IM conversations during the day, which is pretty much normal if you’re with someone in the tech industry. He gets to work the hours he needs to work without any guilt of his wife at home. It’s tough. I miss him. When we’re together for a week or more the separation is much worse and raw. I expect change to happen. I don’t know when, I don’t know what. But for now we are going with it all. So I’ll do my best to answer today’s questions. I have friends who are back to dating after divorce in some cases, so maybe that will help me? 1. List five characteristics that you think are important in a significant other. Willingness to communicate. Crucial! Things need to be said. A sense of humor. Life is crazy, you have to laugh about it all. Honesty. There’s never a good reason to not be honest. I’m lucky I married a terrible liar. Sense of present. Not the gift variety. Knowing that here and now is important. Enjoy the present. Live for the moment. Don’t take today or tomorrow for granted. Appreciate what’s around you now. Integrity. If you are hitching your star to someone else’s, it better be going in a direction you can appreciate as well. Someone you believe in, who believes in you, and that you can stand together and know that you are being the best you can be. 2. If you had to choose between staying single for the next two years (as in, no dating at all,) or receiving $10,000, which would you choose? Even if I was single, I’d pass on the money. Having a good relationship is such a gift, and if you are single you have no idea who is just around the corner. Timing is everything, and why mess with what could be your time over some cash? 3. What is your relationship status? Are you satisfied with it? I’m happily married! I covered everything I wanted to say about this above. I’m so glad I married the man I did. We’re better together than we ever were apart. 5. Would you date someone who’s shorter than you? I probably would have said no in my 20’s, but I don’t think it really matters much. I find myself attracted to really tall men. 6’4″ used to be my magic number, but I married a 6’1″ who slouches. A women being smaller than a man is such an outdated part of our collective culture. Women are not less than men, in any way. We can make more $, have a great job, and yes, be taller. I hate that diminutiveness is considered attractive in a woman. Celebrating our wedding anniversary by doing one of our favorite things – drinking wine! 7. If you were going on vacation together, would you choose the beach or the mountains? The beach because there’s likely more going on. My husband is a city boy through and through and quiet drives him crazy. Not having WiFi would kill him on vacation. I’d prefer the beach because I’m so comfortable whenever I’m near the water. 8. How do you show someone that you’re interested in them? Back in THE DAY (College!) I’d say I would show them I was interested basically by stalking them. I’d just happen to be where they were! Imagine that! In high school I’d time roughly how long it would take for a certain someone to go to his locker, get his stuff and walk by where mine was, so we always left the same time. In college I’d go to the dining hall nearest to his dorm. I would totally do drive bys! It was moderately creepy, but it got results for me AND my friends. I’d do crazy things to get a number for a friend. As I got older, and ballsier, I’d just tell them. But probably after a little stalking. 10. Share some details of your dream date. Okay, dream date with my husband! It would be here in San Diego. We’d spend part of the day at the Zoo or just doing stuff around the city. Then we’d have a nice dinner, hopefully involving red meat to help with my anemia. We’d go to a fantastic dessert restaurant to top it off, and then at the end if we could manage to keep going (but this is a dream, so let’s say we do) we’d end up at my favorite dueling piano bar. I am back from my wedding anniversary trip! I got home around 10 last night and found a very cranky, needy kitty waiting for me. It was a rough night, she really missed me. She had a lot more separation anxiety than she usually does. We drove to Paso Robles from Palo Alto and spent a day wine and olive oil tasting. It was a very low key trip, but super fun. And now, no more wine as we’re embarking on another Paleo cleanse. I’m not calling it Whole30 this time because I know I’m not going to be as strict and Patrick’s only committing to 28 days. So Whole28(sorta) wouldn’t be a good name, now would it? 1. What is your favorite flower? By the strictest definition of this, I’m going to say Star-gazer Lilly. But, I also love lilac blooms. They smell amazing. 2. What is a date on the calendar that you’re looking forward to? October 12 because my friend Amiyah will be home from Singapore briefly! I miss her. She’s there working for 2 years and I definitely intend to go visit. 3. List at least five characteristics of your ideal mate. Sense of humor, integrity, open-mindedness, kind, must love cats. 4. What is your favorite travel destination? I’ve only been once, but I’d love to go back to London and show it to my husband. I love that there’s so much history there and that things have been there for a long time. We take for granted what a young country we are. 5. What is your idea of the perfect date? I’m a fan of dinner and a movie! A chance to talk, a chance to get entertained, it doesn’t get much better than that. I know it’s simple, but sometimes that’s better than the more elaborate things. I’m sure zip lining in the rainforest is awesome, but I like just being present. 6. What is your relationship with your family like? I’m close to my parents. We talk once a week and I think of them both often. My mom and I have a little trouble with boundaries. My dad is difficult to get to open up. I love my extended family, but there’s lots of hurt feelings that taints things. My mom has a lot of half siblings and I’m not that close to that side of the family. They are nice and we sometimes spend holidays with them, but I didn’t grow up with them. All of my grandparents have passed. 7. What time did you wake up this morning? 7:14 officially, but my cat didn’t let me sleep much at all. So probably that could be MANY times. 8. What characteristic do you like most about yourself? Which do you dislike most? I really like my memory. I retain so much. It annoys my friends that I can recall the dumb things they do. It helps me with trivia. It helps me remember which cart I was in on a ride so that I can collect my sunglasses when that cart comes back through. True story. Dislike? I’m not brief at all. I have to express myself in way to much detail. I have a really hard time distilling things to their core. 9. What is your favorite sport to watch?I love hockey, but I think tennis is my favorite. Since I play it, I understand the rules well and I understand what a mental game it is. It’s almost as dramatic as wrestling to me! 10. Share a few interesting things that you did over the weekend. 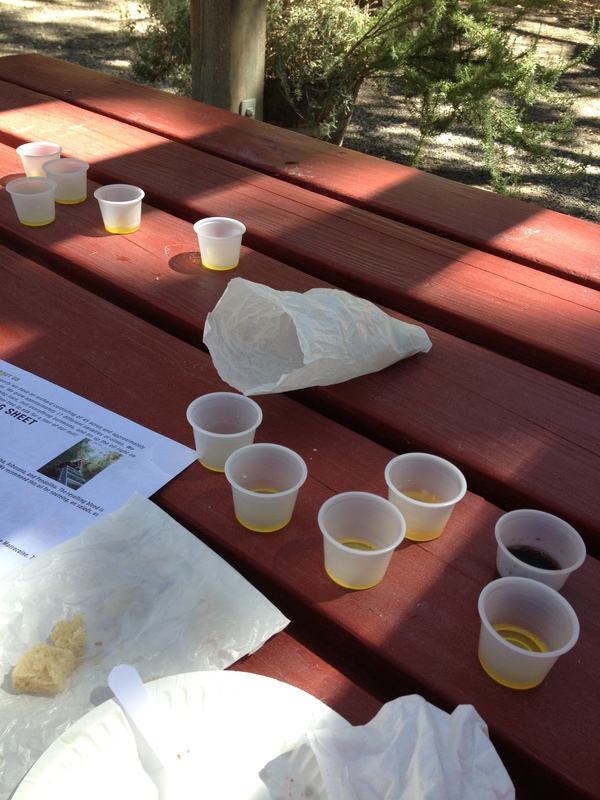 We went olive oil tasting and I realized how different olive oils can taste – not just the infusion oils. I also tried ghost pepper salt, which was HOT. Of course we went wine tasting. We also saw The World’s End at a theater in Paso and that was really a fun movie! 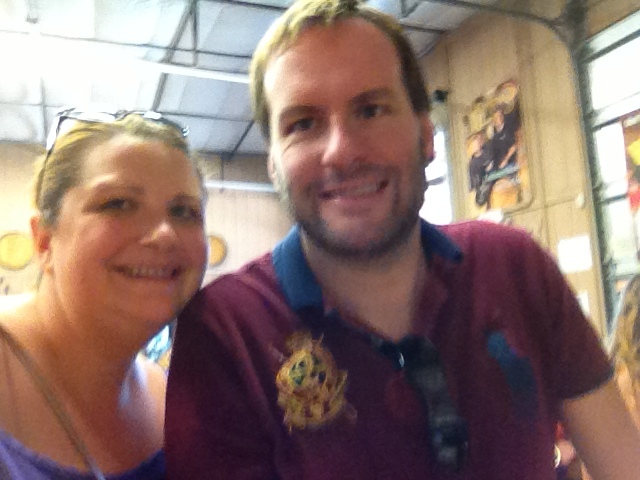 Of course, I had fun just being with my husband since we usually spend the week days apart. This is what olive oil tasting can look like after 2 wine tasting trips. Messy!